Take a moment and imagine living in an environment that would make your heart sing—a home that you couldn’t wait to get back to; a place that accurately reflects who you are (now, not twenty years ago); a physical space that creates a feeling of calm and peace. What does that look like for you? Once you get that picture firmly grounded in your mind, write it down. Remember that thoughts become words and words become action. Zen is enlightenment, totality, and awareness of our true nature. It’s highly philosophical but that sense of completeness can be applied to our homes as well. Zen is calming and reinvigorating. These two words may seem contradictory, but together they create an environment that feeds your spirit. • In the calm, you find peace. • With peace you become more focused on what’s important. • When you are in the zone of what’s important —what truly matters most to you—you are organically invigorated. My goal, personally and with my clients, is to create a “Zen-like” atmosphere that is life-giving. I’m almost always on the side of “less is more”, but in the past few years, I’ve been even more committed to living only with things that make sense. I’m on an anti-clutter mission! When I’m teaching (or let’s be honest, preaching) about organization and design, I define clutter as: anything that is disliked, unused, in excess, broken, obsolete, disorganized or that makes you uncomfortable. Clutter creates confusion. In 2016, The University of New Mexico studied how clutter negatively impacts people’s perception of their homes. Their findings corroborate many previous studies, and what I’ve been saying for years. The bottom line is that because we identify with our homes on a personal level, clutter negatively impacts our experience of home. In addition, this study found that adults see their possessions as part of themselves. In other words, we “grow” attachments to things like we would to other living, breathing humans. When we live with too much stuff, it starts taking the place of interacting with other people. We get to this place where we believe that that possession of objects is an antidote for a lack of relationships. When too much stuff traps us in our homes we become root-bound like a plant, and without “growing space” we ultimately wither and die—not a literal death, of course, but a death to the life that we could have had. • you love it and use it—it has an actual use and it makes you happy (a favorite sweater that was gift from someone who loves you, the Le Creuset pot that you make the perfect Bolognese in, the chess set you bought on a trip abroad) This is obviously the ideal situation! If it doesn’t fall into any of these categories, then you say, “goodbye” and give it to someone who would love or use it. You might be thinking, “What does clutter have to do with a Peace Full Home?” The answer is, “a lot”. Lack of clutter is an integral part of a calm, joyful home. It’s tough to get to a Home Full of Peace if you’re surrounded by chaos. That chaos can be created by so many things: relationships that are tumultuous, construction sites outside your door, neighborhood feuds, scarcity, loneliness, and things. Creating calm doesn’t just happen. You need to be intentional about it! Having a restful place to retreat to at the end of your day, or to take some time out is critical. Too often, “you can’t see the forest for the trees”. That means that there’s often so much stuff that you can’t see the big picture. I can’t say enough about how clutter impacts the way you live. Inner peace and serenity are helped by outer order and calm. 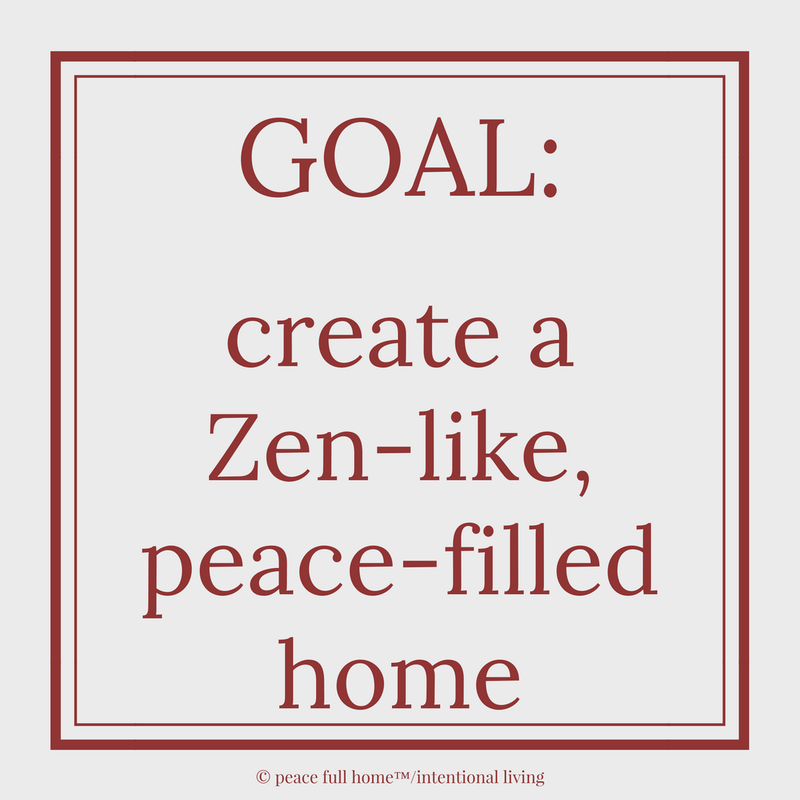 Set an intention like “I want my home to be a serene, calm restorative sanctuary, where I can be my best self”. We accomplish the most when we’re focused with a specific intent. The home you live in and the environment that you create, should reflect your life. Let’s make that a reinvigorating, calm and peace-filled reality. This entry was posted in Peace Full Home, Peaceful Home and tagged bolognese, clutter, Le Creuset, less is more, peacefulness, possessions, root-bound, Zen. Bookmark the permalink. So well said! Love the research to support what you (and I) know to be true about stuff. Thank you Dan. Blessings to you!